a constant state of flux. : those little feet. Amos has a been fighting another cold, now feels warm, and is a little irritable. I can only say a little irritable because look. at. him. This is about as bad as it gets. He has just wanted to be held nearly continuously the last few days, which is lovely. And then my arms start to hurt. And my back aches. And the kitchen is dirty. But then I look at his sweet face, and everything else literally fades away. Amos does this - his calisthenics. That flexibility is unbelievable. And unbelievably cute. Jacob is showing the characteristic reddened cheeks, the listlessness and irritability - evidence of his blazing fever - and is just all around miserable. Thank goodness I ate so much cheese last night at a friend's house, so it helps wash the whine down. Joking, of course. I don't have wine in the house. (right now. ha.) Isaac had to come home from school today, not feeling well either. 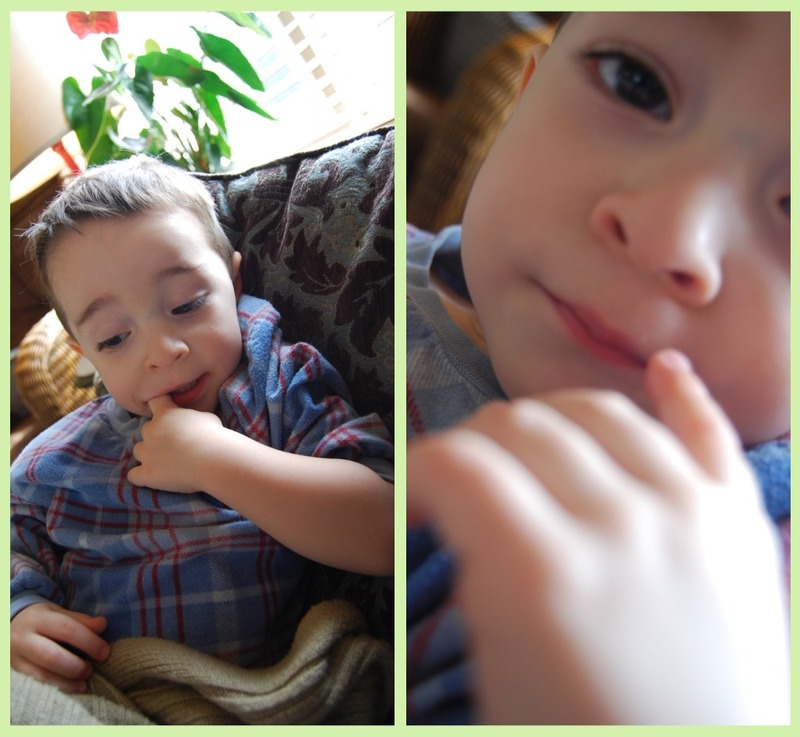 Fevers and coughs and sore tummies, oh my! These boys enjoyed their snuggle time today - or in the words of Jacob - "nuggo time. wanna nuggo." I hate to see my kids sick, like anyone else. You want to make it all better, hoping mama's kisses will wash away the pain, the fever, the aches and chills. And in the middle of it all, today? I feel completely out of sync. I feel like a record is playing and keeps skipping just when it's getting to the part of the song that I know, the part I want to sing along with. You know that awkward feeling? Singing along, and the music stops and you are the only one still singing? And you're off key? Or like when you try to go upstairs in the dark – and you mistake where the last step is? Has anyone else done this? You take an extra step, thinking there's one more there, and your leg jarringly comes down to the ground later than expected, assaulting your heightened senses in the dark. It never fails to surprise me. Yes, I've done it more than once – and yes, that's how I've been feeling these days. Taking steps that are landing in unexpected places and being jolted out of where I thought I was going. Sounds like a mighty big metaphor, but it's nothing great or grand. Just jolting. Catches me off guard. Leaves me feeling a little breathless, scared, annoyed, and giggly. My head feels a bit like it's screwed on backwards. I have been blaming it on the life of a mama, lack of sleep, always so much to do. You have to be 'on' all night, even in your sleep. The mama is the first one to propel herself out of bed at the sound of a snuffling baby, waking to feed or needing a little loving to be cradled back to sleep in a big person's arms. Amos is way into this reach and grab these days - I mean, he's been reaching for months, but he is just. so. excited. about it now - even if he's really cranky, all I have to do is dangle my hoodie strings or the camera cord in front of him and he springs into action, limbs kicking and eyes huge and searching and body all a-tremble with excitement. It's so funny - and so dang cute. Only problem is he reaches for the camera or the lens so often that many photos are blurred because he's jolted the camera just as I was about to snap a photo. It continues to be gray here. Very gray. Some days, the gray weather that continues to persist just saps the energy I am able to muster to pull myself out of bed far earlier than my bones wish for. Coffee is my friend. Freshly opened peanut butter helps me feel a little excited. It really is the small things. 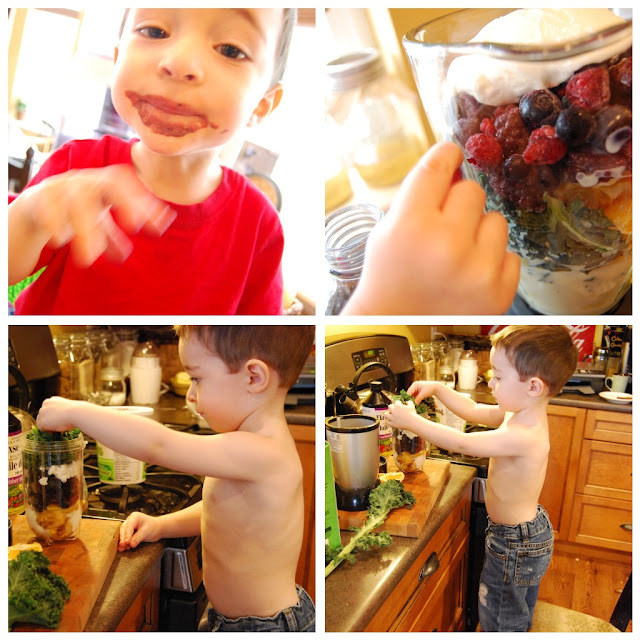 We get by, making our smoothies chock full of delicious and nutritious ingredients – but I knew the day would come that my crappy cheap blenders (yes, I had two of them, long story) would bite the dust and we would be excitedly on the hunt for a new blender. For now, we use the magic bullet - it works for single serving smoothies rather nicely. Somehow leafy green things and berries and cool, mixed drinks sucked through straws feel like warm weather is out there somewhere. So does getting it all over your face. Dancing with the kids wards off the gray. 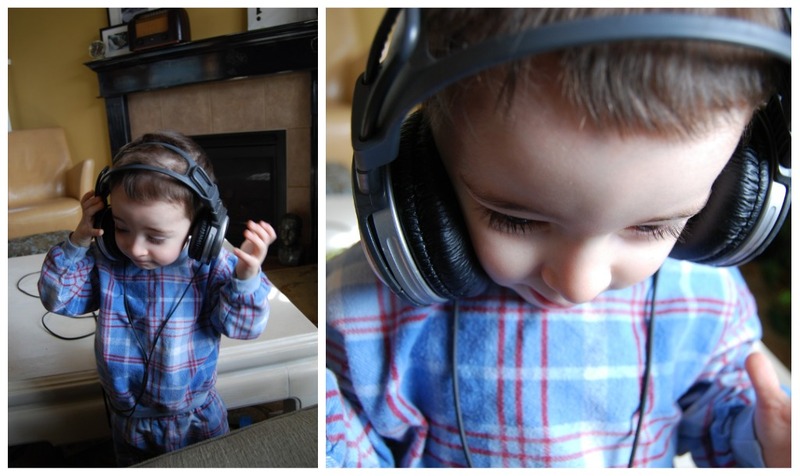 Watching Jacob listen to music and *you can see the music making him dance on the inside* - helps ward off the gray. We are currently mildly obsessed with Mike Tompkins on youtube - Jacob knows Mike Tompkins by name and this is generally what we hear when he gets up in the morning. "Wanna hear Mike Tompkins." And Jacob insists we all throw our arms up in the air when Mike Tompkins says to Put Your Hands In The Air. A lovely mid-morning visit with my friend Angie helps ward off the gray, her sweet babes Molly and Zeke - and her colorful house always filled with delicious food (seriously – she is such a creative cook - she just whipped up cashew chicken for us for lunch. Pure. Deliciousness.). Her yard is full of crocuses, a sure sign that spring is on its way. I sometimes forget what month it is, wondering if Oh No We're Not Just Heading Into Winter, Are We? Not even joking. I really do. 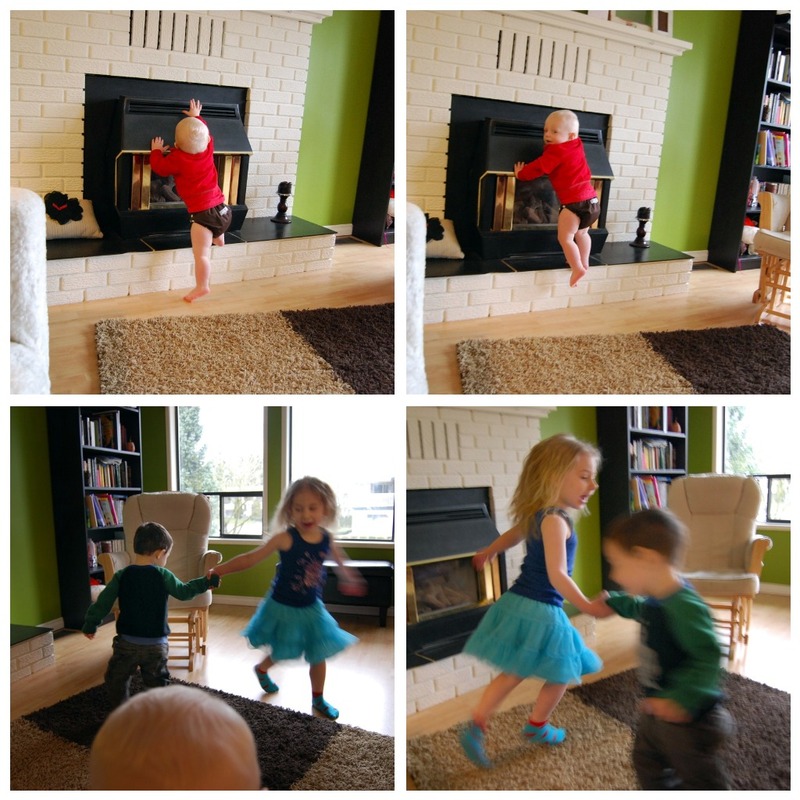 Climbing Zeke and Dancing Molly. Molly always asks if she can hold the baby. She does, and then she's done. And she's off for more dancing. 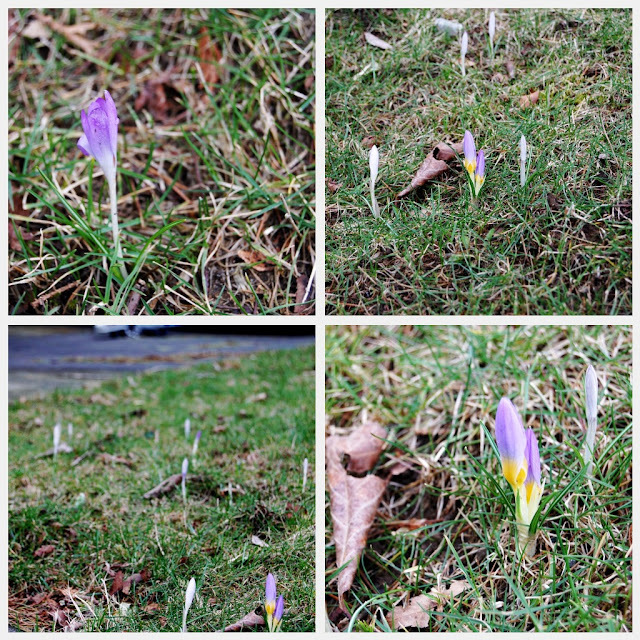 Crocuses. All over their yard. Beautiful. After being at her house, inspired to be a good cook of cool and interesting dishes, I spent some time hunting for ideas for how to make delicious food to invite people over to eat with us. Then I started to think about how cool it would be to form some sort of dinner club, where a bunch of couples get together at each others' homes once a month or something, and make fun and new and exciting dishes to share. Grown-up playdates, kinda. Anyway, I was drooling over recipes for mussels in white wine broth which reminded me of delicious times in Calgary at Tango Bistro with good friends - which then reminded me of Vietnamese salad rolls, so I had to look up a recipe for those, and then I got that all-too-familiar pang of longing for Chi Lan. I found this one for an easy Asian noodle soup - hunting for something to fill the gap left in our lives with the absence of our favorite Vietnamese restaurant that we left behind in leaving Calgary. Ah, Chi Lan. 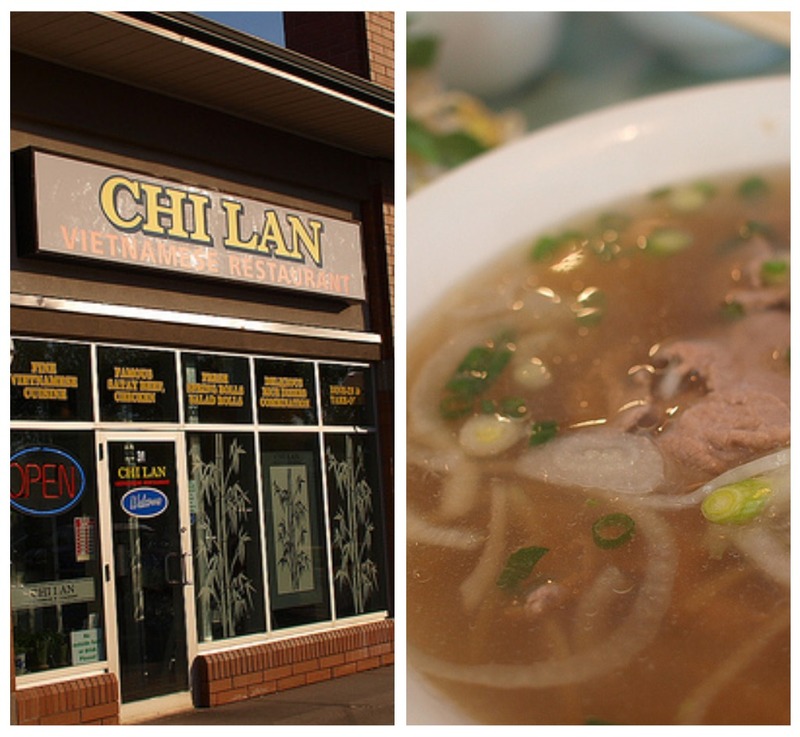 Your large 29, the spicy beef sate soup calls my name from across the mountains. This recipe was good, but it was no large 29. Still, everyone enjoyed it. It was perfect for today, yet another gray day with so many sore tummies and headaches and achey bones. This week, I set up a mirror on the floor by Amos's play mat. He loves it – loves seeing himself in it and will smile and coo and talk to the baby in the mirror – but Jacob? He goes nuts, performing for the kid he sees in the mirror. There's another grab. Funny boy. Oops, and yet another one. Ha! After my last post that was pulled a bit from an old post, a bit from a few outside sources, and a bit from my guts, I felt a bit like I was floundering around in the dark, taking that last empty step onto the floor without being able to see properly. Searching for what else to be soul-searchingly honest about as that only felt appropriate, I caught a glimpse of my kitchen table. I admit I have a problem. I am not a wiper. My table often still has evidence of the previous meal when we sit down to eat. I somehow so often neglect this last step, opting to move to the other room with the rest of my family, where we recline and play and laugh and squeeze in a few warm moments before bedtime. I do recall several years ago after the birth of my daughter, my second child. I had to make a conscious decision that housework had to take a backseat to time with my kids. A memory of me falling to my knees on the floor, collapsed in tears, and overwhelmed with the never ending cycle of dishes, laundry, diapers, feedings, not sleeping, and long lonely hours without adult interaction. I remember trying so damn hard for everything to be perfect All The Time. It just wasn't possible. I felt I could sweep my floor seven hundred times a day and it still wouldn't be clean if I had company coming over. And the thought occurred to me now, again, as it had also a few years ago. Maybe it's not supposed to be clean when company comes over. If I went to someone's house and the table needed wiping? I'd probably just help wipe it, even without thinking or saying anything. In magazines, the pictures are always so pretty and perfect and unlived in. I remember hearing a sermon once where the pastor spoke about how we work and work and work to make our homes look as if no one lives there, like in a magazine. I remember visiting my friend Jess once, back in college, and feeling that infinite inadequacy that seemed to be inherent with being female, or being human, perhaps, trying to live up to the magazine ideal - and I realized I hadn't seen where she lived before... thinking how my home had been left in a complete state of disarray that morning, it was finals time - and then we walked in. There were papers scattered all across her living room floor, dishes on the counter, in the sink, her table and chairs being used as a drying rack for laundry unmentionables (or I guess I just mentioned them...?). She laughed about it, and was very honest in asking "please don't judge me, I live here." I felt such peace. I felt like I was not alone. I was not the only one who didn't have all my sh!t together. And we were both okay. Some women can balance these things. I am not one of them. So you'd think by this stage that I'd be okay with that - thirty five years old, mother of four... but no. I still long for that clutter-free floor that remains clutter-free, for sparkling surfaces, and for the laundry to just. stop. please. I would still love to have a magazine pretty home. My kitchen has still not been coaxed into recovery from the war I waged on it a few posts back. I guess we live here. We live here. And then there are times, like now, where all children lay asleep in their beds, I have a hot cup of tea in front of me, it's tendrils of steam rising up, and calling me up into a better frame of mind, enticing me, drawing me in to a state of gratefulness. A moment of peace where I realize it is right now that I love, it is the children that make the mess that I love. Just as they are. All of them. Right where we are. I know that sacrificing these things and living amidst imperfection is its own perfection. The time I don't spend slaving over my floors is time I can spend snuggling my babies to my chest. It is time I can play on those floors and see the little footprints there, and do my best to cement the images into my memory for the days that I know are just around the corner where those little feet will get bigger and bigger and then will walk out the door. Forever. Time flies as it does, and I know that no matter how long these days may seem, I know it will be in the blink of an eye that my floors will stay perpetually clean, my laundry will be minimal and manageable, our kids will be grown, and I will long for the days of toys on the stairs and tiny bodies demanding my energy, my attention, my heart, my mind, my spirit - the days of yogurt congealing on the table, the Never Ending Piles Of Laundry and clumps of porridge hardening beneath the highchair. And their soft skin. Their sweet sighs of contentment when sleeping. Their little faces. Their little tummies. Their little feet. Their little everything. I choose to soak it up while it lasts, and vow to be a good table wiper when they are gone, on and out and growing their own lives. There's another grab going for Jacob's carrot. Now I see my dirty table in a new way. A precious symbol of my little ones, leaving their mark and taking up my time and energy. These are all good things. 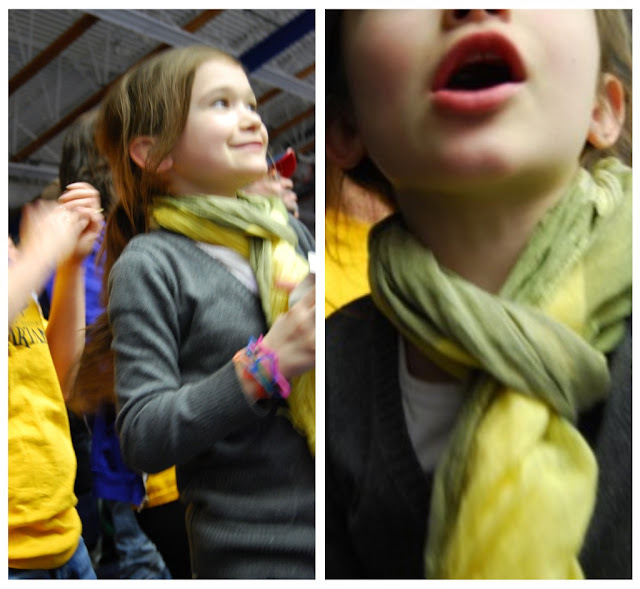 Egan, cheering on cousin Ben and his Team Spartans as they won their game - and then won GOLD in Volleyball Nationals. She is still working on her post here and there, wanting to really give it the effort it deserves. I spoke too soon, obviously, in saying that it would be next. I don't know when it will actually be ready. So now that we're feeling all warm and fuzzy, it's time for another giveaway. One random commenter on this post will receive a handmade warm and fuzzy scarflet, made by the lovely red headed Angie. My new friend. She is lovely, as is her handmade warm and fuzzy. She gave one to me, and one to give away. Spring is coming. Sigh - this time, its with contentment. I am exhausted, yes, but I am in love with these little people and their footprints. And their little feet. A friend of mine sent me a link to your blog. Love it! And your children are so beautiful! Am loving the scarflet - please include me in the draw! Someone once told me that Rosanne (of the TV show) said, as she walked into her house, "excuse the mess but I live here". Sticky fingers means full bellies. Toys on the floor means sparkling laughter. P.S. Try avocado in your smoothies. Delish. "A moment of peace where I realize it is right now that I love, it is the children that make the mess that I love. Just as they are. All of them. Right where we are." My mom reads it too! I love the scarf...so cute! Take care, hope you all feel better soon! You inspire me. Completely. Thank you for teaching me to embrace the cozy feeling that rain clouds bring. I have the same table wiping problem, I just spot cleaned last night's dinner off where either of the boys were to sit for breakfast and left the rest. I struggle with my messy home all the time, feeling guilty...but you're right. I live here! I have one just like the green one! I love it! I ordered it off of etsie! Lovely post Laura...and yes, we try too hard to clean ALL THE TIME. Instead of spending time cleaning we should all just nuggo. Oh, WHEW! I needed this post. 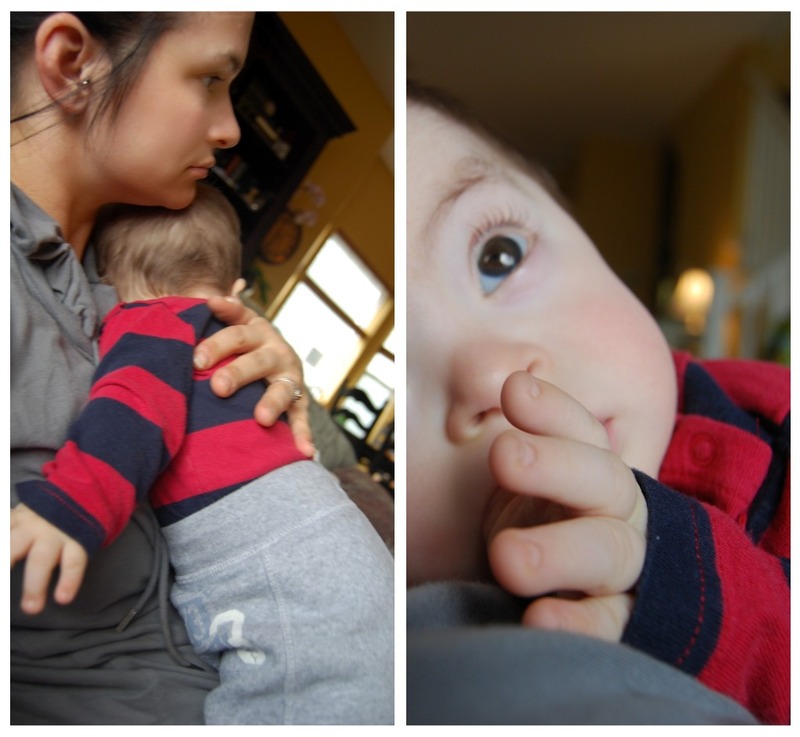 Feeling so inadequate today.....but now, at least, I don't feel alone :) We (Mamas) are so hard on ourselves. Thanks for the reminder that we are doing the right thing. I always tell potential company, "If you're coming to see me, come right on over...if you're coming to see my house, give me two weeks notice." We "live" in our home, too. Your children are so beautiful, as are you! p.s. 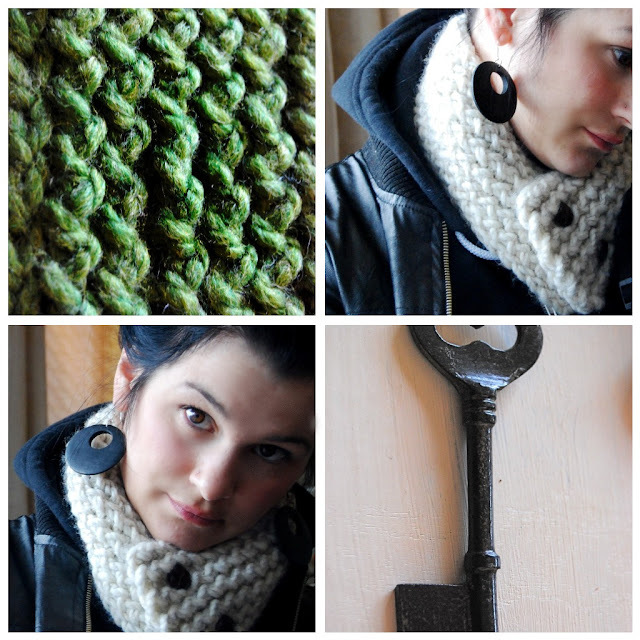 the scarflet is beautiful! So cozy and pretty for these cold, gray days. Is it enough to let you know that I love you, am inspired by you and grateful for our childhood memories? I say often that my house is not perfect, but it is filled with love, and that is what makes it our home. You're WLFG co host ... (sorry super protective about privacy things). Hi sweet, Laura. Once again - your blog touched my heart and reminded me why I liked you the moment I met you. Thanks for your honesty. And, thanks for helping me clean at my house when I couldn't do it myself. I will remember that for a long time - how you came and cared and expected nothing from me in return. Big Minnesota winter hugs to you. p.s., I can hardly stand it that I won't get to snuggle wee Amos. So thankful I got to have at least a little bit of special time with him before we moved. Way to inspire fellow mommas. It is so darn good to hear other people say "hey, i don't have it all together!" I will venture to say I am not alone in this habit I have of listening to that voice in the back of my head that lies to me saying that I am not good enough or that other people manage to do the things I can't and look way better doing it. You're so right that the truth is, God blessed us with these babes so we can sit and love them not make sure we look good enough for some unknown audience we pressure ourselves for! You keep sharing and preaching it from the heart, fellow Laura. What you say matters and touches others!